The Thank-Scrip-ing Day clock starts now! We're partnering with some of your favorite retailers to offer 24 hours of awesome ScripNow®, Reload, and ReloadNow® bonuses from 12:00 a.m. - 11:59 p.m. Eastern Time. Check the tiles below to see which products are on bonus, and click any logo to go right to the Shop page. * ScripNow purchased with PrestoPay will be available in minutes. 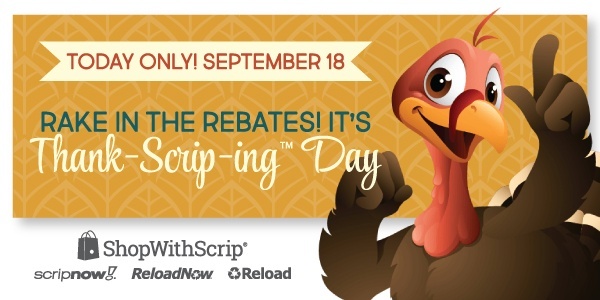 Orders placed during the 24 hour promotion and paid for by check will still receive Thank-Scrip-ing Day rebates, and families will receive their ScripNow eCard in minutes after the coordinator releases the order. * Reload orders placed before 3:30 p.m. Eastern Time will be processed overnight, and funds will be available the next day. The merchants represented are not sponsors or otherwise affiliated with Great Lakes Scrip Center. The logos and other identifying marks used are trademarks of and owned by each represented company and/or its affiliates. Please visit the company's website for additional terms and conditions.